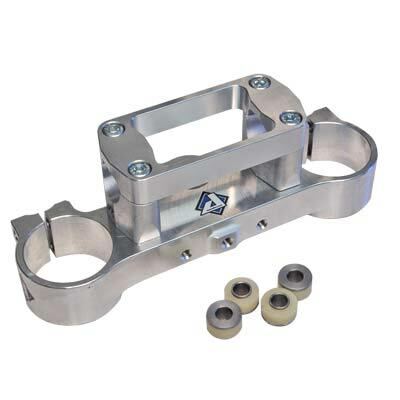 This top clamp kit is rubber mounted and includes the top clamp, bar mounts, hardware, and cones. Bar mounts are bolted on perpendicular to the top clamp not at an angle like the stock set up. This gives the rider much more room. The Rubber mounts will reduce vibration. Choose oversized or standard bar mounts. Optional height bar mounts can be substituted in the kit at no extra charge. (+5, +10, and +15mm height options are available). All stock gauges, accessories, etc. will work with this clamp. The kit is anodized black with the Applied logo engraved on the top.